Serve a do-it-yourself Mexican dinner and let friends and family pile on the seafood, pork, chicken, beef, or fresh veggie toppings into soft or crispy tortillas. Every night can be taco night when the main dish is this easy, delicious, and customizable for every taste. Whether you love crispy or soft shells, a lot or toppings or very little, you'll find the perfect plate of tacos just for you. 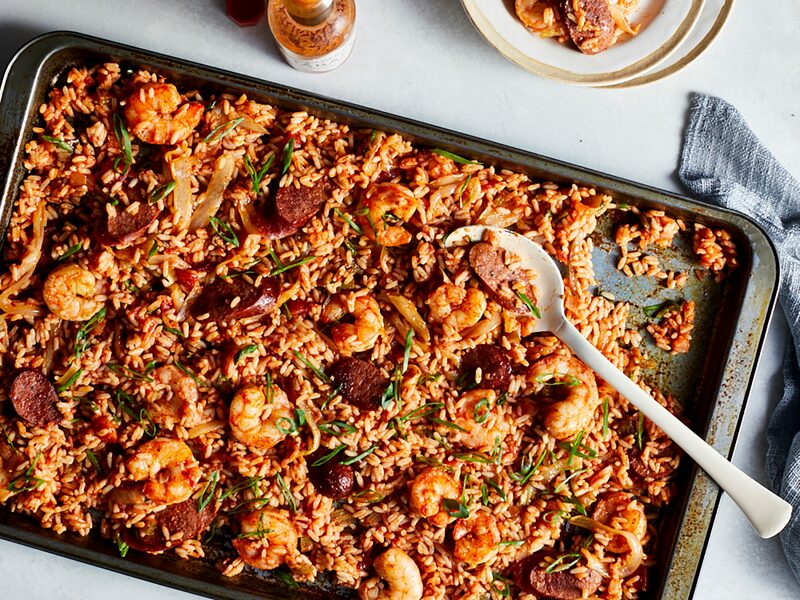 This easy and impressive sheet pan dinner is from Julie Grimes' $10 Dinners: Delicious Meals for a Family of 4 that Don't Break the Bank. For family taco night, set out the filling, taco shells, and toppings, and let everyone craft their own unique creations. Rather than a store bought taco mix pack, we created a simple homemade blend of basic pantry spices. It takes no more than five minutes to measure it all out and blend it up, and provides excellent flavor to a comforting, uncomplicated meal. Aim for just a light coating of flour on the fish for minimal oil absorption--you should only use about 1/4 cup of the flour mixture. We attempted this recipe with whole-wheat flour, but the natural oils from the whole grain didn't allow the crust to crisp properly. This quick taco filling is perfect for weeknight dinners. Poblano chiles bring rich, earthy flavor but little to no heat. (Every once in a while you can get a hot one, though.) If you want to add a little spice, add some crushed red pepper when you sauté the mushrooms. This delicious steak tostada recipe cuts back on calories and sodium by using 6-inch whole-grain corn tortillas instead of flour, meaning you can afford to eat two. These juicy flank steak tacos are topped with an avocado, onion, jalapeño, and lime juice mixture. Serve steak with salad and tortillas. Get a taco dinner on the table in 10 minutes with a simple recipe that quickly infuses bold flavor into raw shrimp by boiling them for two minutes with black peppercorns, lime juice, and red pepper. Spoon the shrimp into corn tortillas and top with tomatoes, sour cream, and green onions, for a pop of color. These tostadas are inspired by classic taco night toppers and sides. Our version amps up the spice while keeping sodium numbers in check. Serve these crab tacos family-style. Place fillings in bowls and let everyone make their own taco. This recipe uses ready-made taco shells, but soft tortillas are good too. Top these pulled-pork tacos with chopped red onion, sliced jalapeños, and fresh cilantro for a spicy south-of-the-border taco dinner. Serve with Mexican rice and canned refried beans. Slow-cooker beef brisket and crunchy fruit salsa make these tacos a perfect blend of savory and sweet. Marinate extra-firm tofu in a mixture of soy sauce, lime juice, and spices for about five minutes, then skewer them and cook in a frying pan, turning until browned on all sides. Fill tortillas with tofu and cabbage drizzled with seasoned rice vinegar. Top with salsa and sour cream and serve. We surround these savory Grilled Fish Tacos with our zesty Jalapeño-Cabbage Slaw that add flavor and crunch to each bite. This is more of a knife-and-fork taco. The soft egg yolk oozes and coats the filling. Though the amount of chicken skin may seem like a lot, it renders out most of its fat so that you only end up with 2.3 ounces after cooking. Use the cilantro stems for the sauce; the leaves will go in the rice. You'll use the parsley stems and carrot trimmings in the stock for Dinner 3 and the broccoli florets in Dinner 5. These hearty tacos are the perfect entree for steak lovers. Tacos don't have to be simple tomato-lettuce-and-cheese stackers. Serve an easy, upscale version that calls for Serrano chiles, white onion, garlic, and shrimp. Plate the taco filling in double tortillas to soak up any excess sauce. Whole tenderloin is seared and sliced for these quick pork tacos. Serve with lime wedges. Blackened Shrimp Tacos take a Cajun spin in preparation and flavor. These tacos are so easy to put together and make a nice addition to your dinner rotation. Give traditional tacos a run for their money with Peanut-Crusted Tofu Tacos with Tangy Slaw. This vegetarian dish may be the one to convert non-tofu eaters in your house. Create authentic Mexican-style tacos by cooking the chicken in a mixture of ancho chili powder and cumin and serving over corn tortillas topped with slaw and avocado cream. Give Tex-Mex a savory-sweet punch of flavor by serving tacos with a chicken filling cooked with ground nutmeg, tart Granny Smith apples, and caramelized onions. 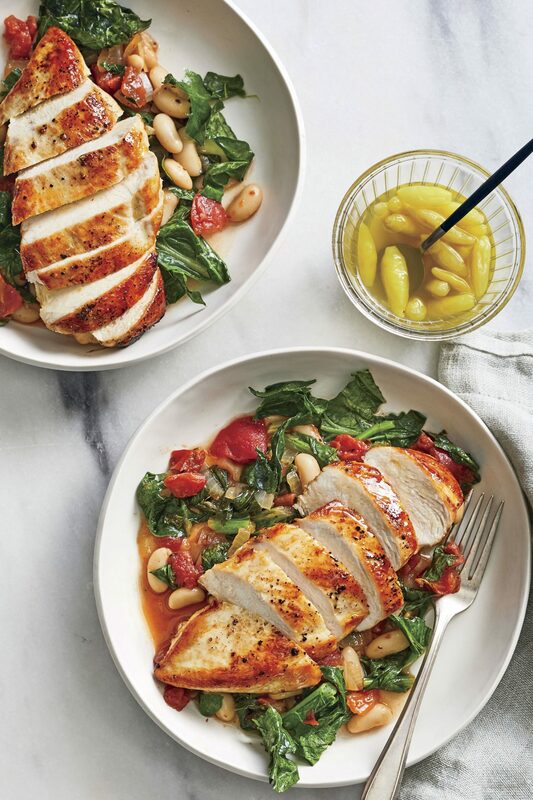 Pair with a bright cole slaw and you'll have dinner on the table in less than 30 minutes. Chinese takeout is even tastier when it gets wrapped in a tortilla. Plus, you get to ditch those pesky chopsticks and use your hands instead. Tacos are extremely friendly to vegetarians, too! Canned beans that are already seasoned help bring these meatless tacos together in a flash. This recipe features shredded beef chuck roast flavored with cola, tomatoes, chiles, and cumin. Bet 'cha can't eat just one. Spice up your standard taco by adding loads of fresh spices and ingredients that make these flavors soar. Make your favorite fried taco dish at home by following our easy tips. Fry an empty shell on one side, then flip and fill it with grilled chicken. Fold the tortilla in half and fry until one side is crispy (about 20 seconds), then flip and fry the other side. Drain the taco of excess oil then let it rest in a baking dish before transferring it to a warm oven, where it will stay warm and crisp until you're ready to eat. Serve with hot sauce and condiments. Skip the ground beef and serve a dinner stuffed with fresh vegetables, dried spices, and three kinds of beans. Chickpeas, black beans, and pinto beans simmer in a fragrant mixture of chili powder, oregano, cumin, and garlic while the simmer with diced bell pepper and onion. Layer the beans in crispy shells and top with the standard Mexican toppers: shredded cheese, tomato, lettuce, sour cream, and salsa. Mix the best of easy Mexican and Italian favorites by serving a zesty taco pizza. Top refrigerated pizza dough with cooked ground round and onion, cooked with canned tomatoes and Mexican seasoning. Bake for 12 minutes, then top with cheese and bake again until the cheese is melted. This recipe is a guaranteed kid-pleaser. The three-pepper spice rub gives the steak wonderful complexity. Minty watermelon salsa is an unexpectedly delicious addition. Tacos... for dessert? Finish off your taco night with these crunchy chocolate shells stuffed with ice cream, peanuts and more chocolate. "Al carbón" tacos are typically cooked over charcoal, but it's easy to mimic that flavor inside by cooking steak, onions, and peppers in a skillet to make a one-pan meaty main dish. Pile the saucy fajita-like mixture into warm corn tortillas and top with fresh cilantro and a dollop of sour cream. Grilled shrimp pairs well with the natural sweetness in the fresh corn salsa. We recommend squeezing fresh lime over any taco just before digging in! A half-pound of pork is a gracious plenty for these tacos, which are beefed up with pinto beans, Greek yogurt-amped avocado crema, and a crunchy slaw topped with pumpkinseeds. The watermelon-mango salsa on these tacos offers the perfect tart and sweet compliment to the spiced jerk chicken. Top these tostadas with fresh avocado, lime juice, crumbled queso fresco, diced jalapeños, chopped tomatoes, and shredded lettuce. Ground lamb would be equally delicious in these fun gyro-inspired tacos. If you can't find the flatbreads we call for, you can use corn tortillas instead. Mexican chorizo is a raw pork sausage flavored with cumin and garlic. If you can't find it, you can substitute regular American breakfast sausage. Ditch the tortilla and serve a simple, flavorful main dish taco salad layered with lettuce, black beans, and steak seasoned with white vinegar, cumin, and cinnamon. Follow our recipe for homemade guacamole, or use a store-bought variety to save time. Make the Walking Taco your trusty sidekick when you're looking for a tasty meal on the go. Tortillas stuffed with scrambled eggs, chilies and cream cheese are ready in just 10 minutes, making them an ideal breakfast for busy mornings. These easy chicken tacos are a great addition to taco night. Give your taco night a little kick of something spicy and a little taste of something tropical by adding paprika and these thinly sliced mangos. Bring the vibrant taste of the Caribbean to the dinner table with a simple six-ingredient salsa, made with pineapple, apple, shallots, cilantro, lime juice, and cumin. Serve over sautéed pork tenderloin with chipotle chiles and a tangy cider vinegar sauce. Toss thinly sliced chicken and avocado together and divide evenly among tortillas for a delicious taco night dish. Your favorite sandwich fillings work just as well stuffed inside a taco shell. Here, fish tacos meet the classic Reuben, and the results are fantastic. Chef Alyssa Gorelick wraps grilled vegetables and tofu in tortillas with an eggplant-and-ancho-chile spread that gives the tacos a rich, smoky taste. The spread is also delicious as a dip with pita chips. Who says you can't make yourself a fancy, classy brunch all at home in the comfort of your own kitchen. For an ultra-hearty start to your morning, fry up some frizzled, sunnyside up eggs and serve them in a warm corn tortilla with grilled flank steak and the works. Suadero, a cut of beef similar to flank steak, is a popular taco filling on food trucks. Get ready for the most epically delicious taco night of your life. The stars? A hunk of skirt steak and a classic, flavor-packed carne asada marinade. While we went with skirt steak, you can use whatever cut of steak you prefer (flank, sirloin, etc.) to soak to tender perfection in the multipurpose marinade. After you’ve allowed your beef to marinate for at least 4 hours (and up to 12) and grill it to your desired degree of doneness, you’re ready to eat. You can enjoy the steak sliced over rice, in a salad, or with your favorite side dishes—or go with our favorite, and serve it as seen here in charred corn tortillas with a variety of toppings, like sliced avocados, crumbled queso fresco, sliced radishes, minced onion, lime wedges, and fresh cilantro. Cubed potatoes make a great taco filling. They crisp up nicely and take on the smokiness and faint heat of the spices. Kale adds a little toothsome chew; you can use any hearty green you have on hand (such as Swiss chard, collard greens, or spinach). The scallion relish is a fresh, tangy condiment that brightens the earthy flavor of the mushrooms and kale. It would also be delicious with your next batch of fish tacos. Want to make Taco Tuesday a breeze? This recipe gets its protein from a Sunday night Big Batch Oven-Braised Pot Roast, which is big enough for both dinners, plus a Monday night Roast Beef Hash in the interim. Fresh fish tacos are topped with Asian Slaw and Quick Chipotle Cream for a dinner recipe that the whole family will love.